Sent to Christchurch City Council 34 sec later. Roadworks sign is blocking the southbound cycle lane on Halswell Junction Rd just south of the Commerce Cresc/Industry Ave roundabout. Sign is associated with construction work on the new O’Neill Rentals building (which has now finished) and could easily be placed on the grass verge next to the cycle lane without affecting sightlines for approaching road users. It is not clear why Thompson Construction thought it was necessary to have a “Works End” sign (especially as CTOC’s Local Operating Procedures require the “Works End” sign to be omitted on all worksites)? 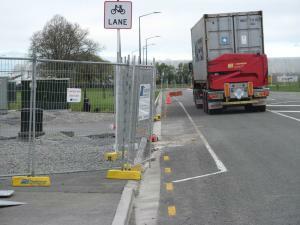 Nor why it has been blocking the cycle lane since June this year?